Many people are surprised to learn that there are lots of succulents that can live outdoors all year, even in cold climates. To help you pick the right succulent for your region, we categorize succulents into two groups: "hardy" and "soft". 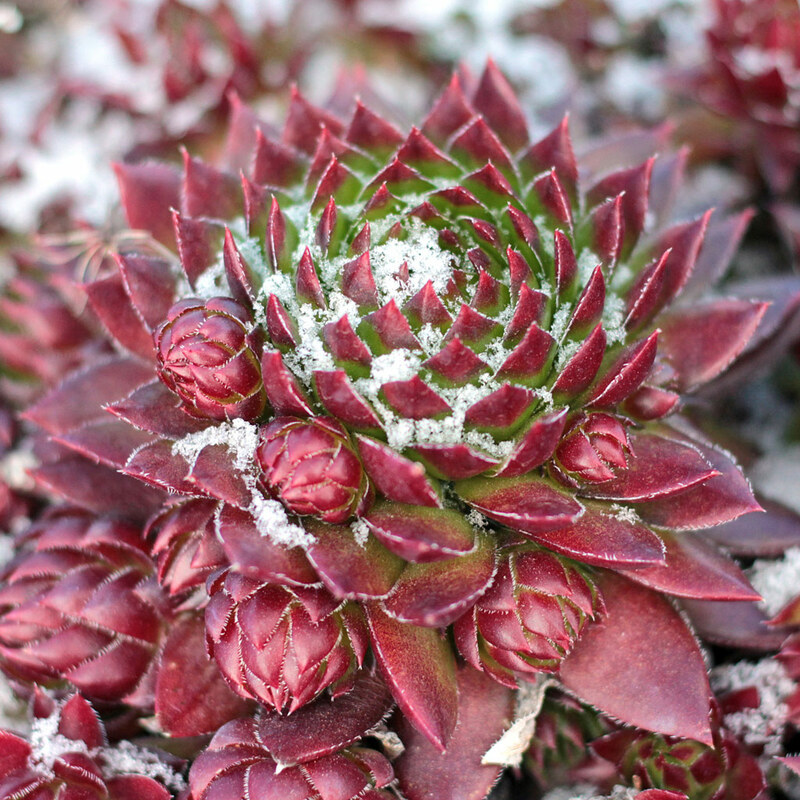 Hardy succulents tolerate frost and can stay outdoors through below-freezing temperatures, making them ideal for year-round outdoor growing. In fact, hardy succulents grow better outside than they do indoors. Soft varieties are not frost-tolerant and might love to spend summer in the sun, but must come indoors in the fall if you can get freezing temperatures in winter. Plant zoning can get more specific too. Using just your zip code, find your USDA Grow Zone, which is based on minimum winter temperatures. 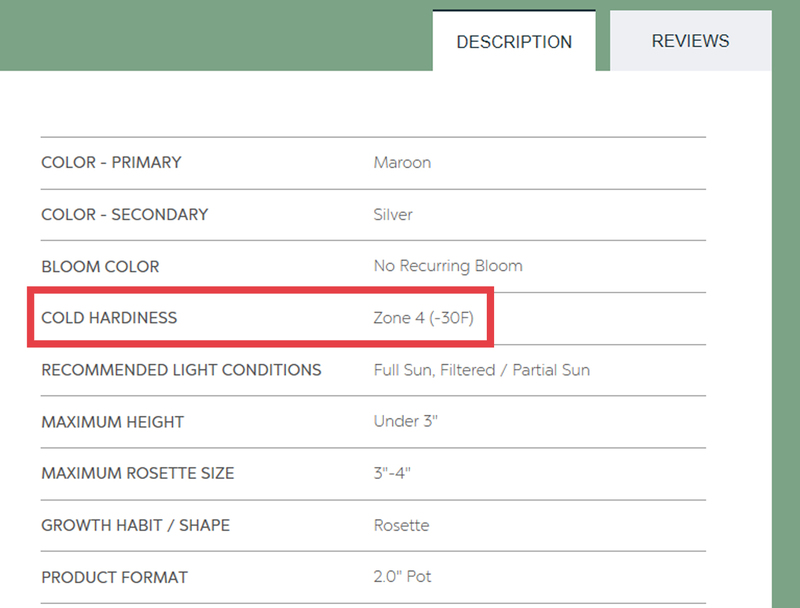 On every plant’s description in our online catalogue you can find its “Cold Hardiness”. If the number of your zone is equal to or greater than that of the plant, that variety can survive outdoors year-round in your climate. If you live in a zone with a lower number than the plant's Cold Hardiness, it will have to come indoors before temperatures start dropping in the fall. For indoor succulents, your best bet will be Echeveria or Senecio, if you can keep them near a sunny window. Can’t get enough light? Then Indoor Succulents with low light requirements are for you, such as Haworthia, Jade (Crassula), and Air Plants (Tillandsia). There are also plenty of succulents that can survive outdoors through winter, even in very cold climates. 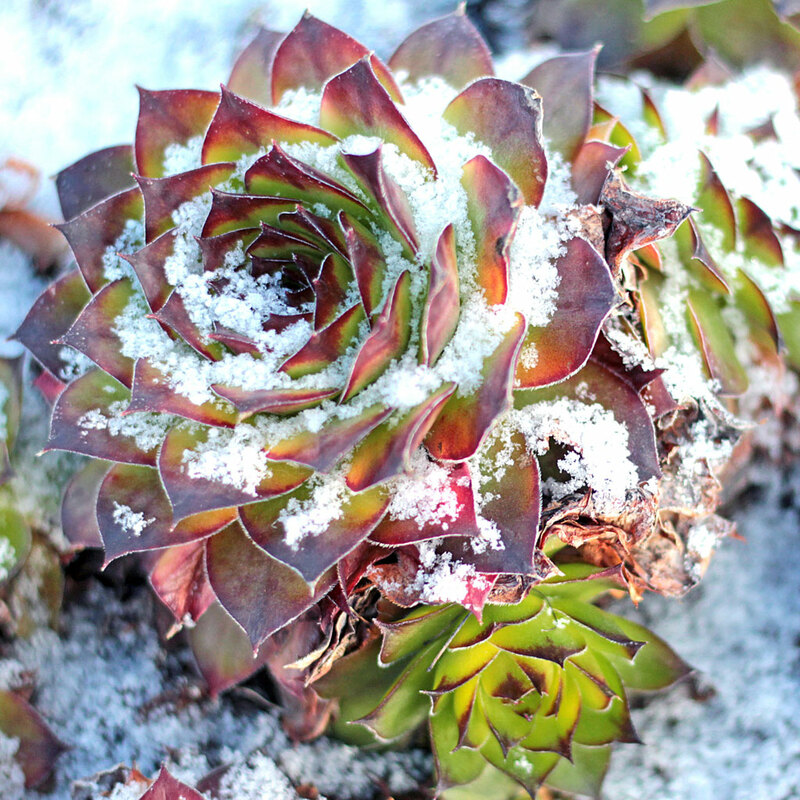 These Hardy Succulents do well in cold, snowy winters and some of our favorites, the Sempervivum heuffelii types, even hold on to bright, jewel-tone colors year-round. You can think of succulents as falling into one of three categories: winter growing, partially dormant, or fully dormant. Most types are partially dormant in winter; while they won’t change drastically in appearance, they are not actively growing and need less water and no fertilizer. There are a few types that go into a deeper dormancy and experience foliar die-back. Sedum spurium will lose leaves like a deciduous tree while Sedum kamtschaticum and Orostachys sp. will senesce completely above-ground, leaving nothing to see. Expect these types to be unavailable or dormant at our nursery from November through March, but their root structures live on, ready to spring back with foliage in April. 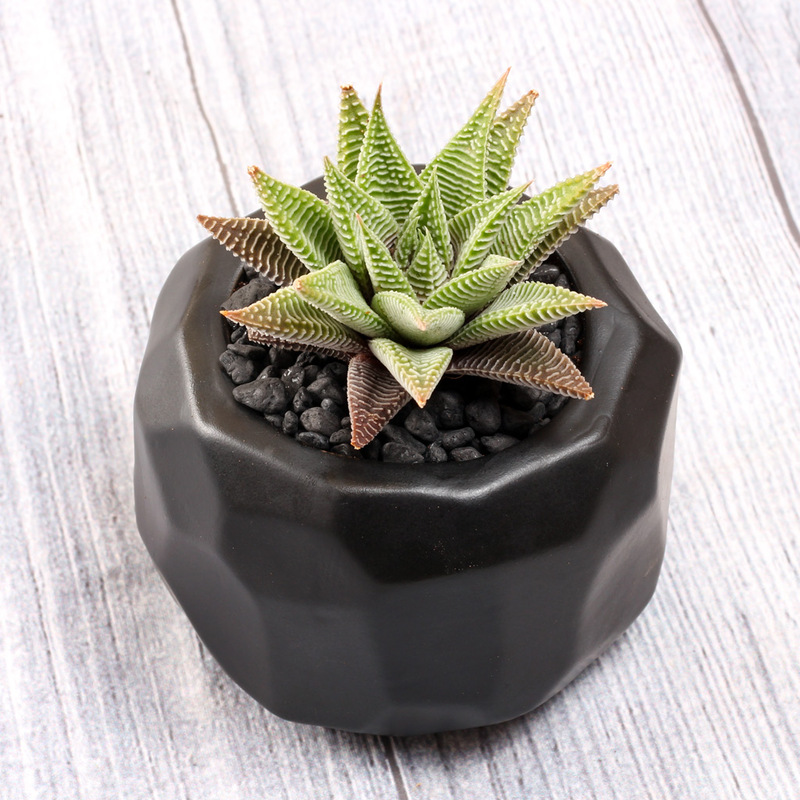 On the other end of the spectrum are the varieties that grow during the cooler months, namely Aloe, Haworthia, and Aeonium. Shorter days and lower temperatures initiate their growing season, meaning that they will need more water and nutrients. If you choose to fertilize, winter is the season for it with these varieties. (Potentially) transplant: If you have a couple months before the first frost, consider transplanting potted succulents into the ground, as in-ground plantings are better insulated than those in pots. It is, however imperative that your succulents are fully rooted and acclimated before frost hits. If there’s not enough time, simply move potted hardy succulents to locations with morning sun that are protected from heavy rainfall. Remove dried leaves: Healthy succulents naturally lose basal leaves as they grow new ones above. In climates with cold, wet winters, however, these leaves can get soggy and become a source of rot. 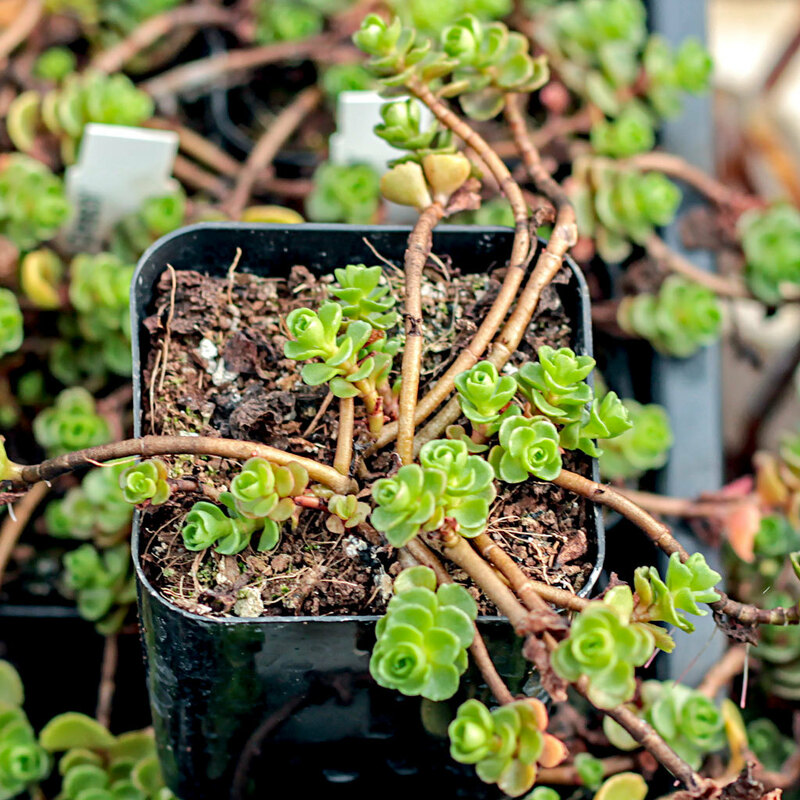 Remove them in the fall and your succulents will not only look tidier, they will be more resilient against disease. Protect from water: You’ll find hardy succulents need less frequent water from you in the winter, but it is also important to protect them from water dripping from roofs and trees. 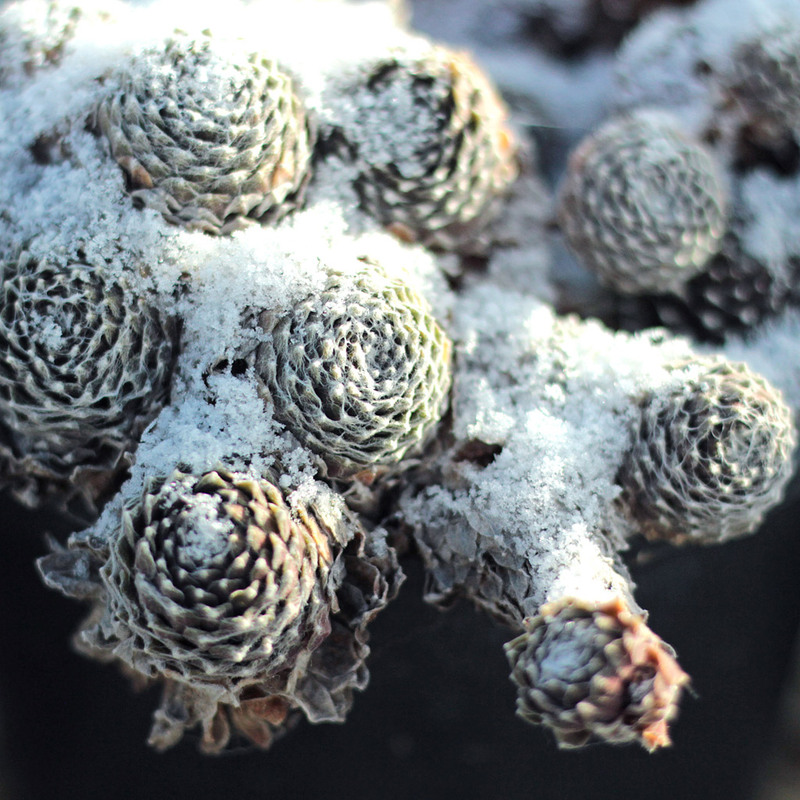 A hardy succulent insulated under a blanket of snow can weather the winter well, but one left cold and wet is at risk from rot. If you get cold, wet winters but no snow, consider moving your succulents under a roof or positioning a clear rain cover at least 18″ above them. If you grow succulents that cannot survive outside, year-round in your grow zone, it can be beneficial to move them outdoors in the summer for sunlight and bring them back in before temperatures drop too low. Transitioning a succulent to indoor conditions for winter means paying attention to light, air, soil, and water. Light: Indoor spaces inevitably get less sunlight, so it’s important to put sun-loving succulents like Echeveria, Tender Sedum, and Soft Hybrids near a sunny window and rotate their pots regularly to prevent stretching and fading. For rooms that just don’t get enough sunlight, you can supplement with a grow light or try Indoor Succulent Varieties like Haworthia, Crassula, and Senecio that can tolerate low light. Airflow: Without the wind and ventilation of the outdoors, indoor soil does not dry as fast, making succulents vulnerable to pests and rot. You can run fans or open windows to keep air moving, but changes to your soil mix and watering frequency can often be enough to speed drying. Soil & Containers: Bringing succulents in for winter is the perfect opportunity to fix any drainage issues. Use a gritty mix like cactus/succulent soil from a garden center, or make your own with 1 part potting soil, 1 part coarse sand, and 1 part perlite or pumice. Adding rocks to the bottom of a pot will not increase drainage, so we strongly recommend using pots with drainage holes. Water: You should find your watering frequency decreasing for indoor succulents in the winter, as it takes longer for the soil to completely dry. 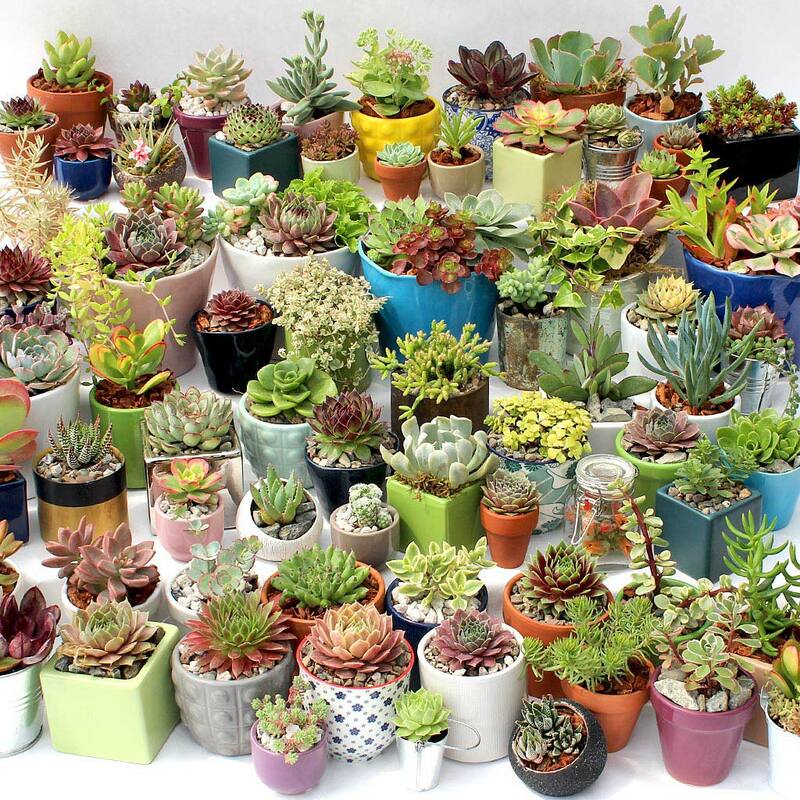 Without sun or wind exposure, water will evaporate more slowly and succulents that are not actively growing will take in less water (except the winter growers, Aeonium, Aloe, and Haworthia). Winterizing succulents indoors or out can be simple and hands-off if you pick the right variety, keep it in its preferred location, and give it plenty of light and just enough moisture. It can seem like a lot the first time, but it gets easier with experience and we've got plenty of it! Don't hesitate to reach out with questions. We're here to help ensure your succulents make it to spring looking their best.